A life-size, fiberglass bear statue painted with nature scenes and rubber boots, part of a “Parade of Bears” display, stands in front of offices of Great Land Trust in Anchorage, Alaska. 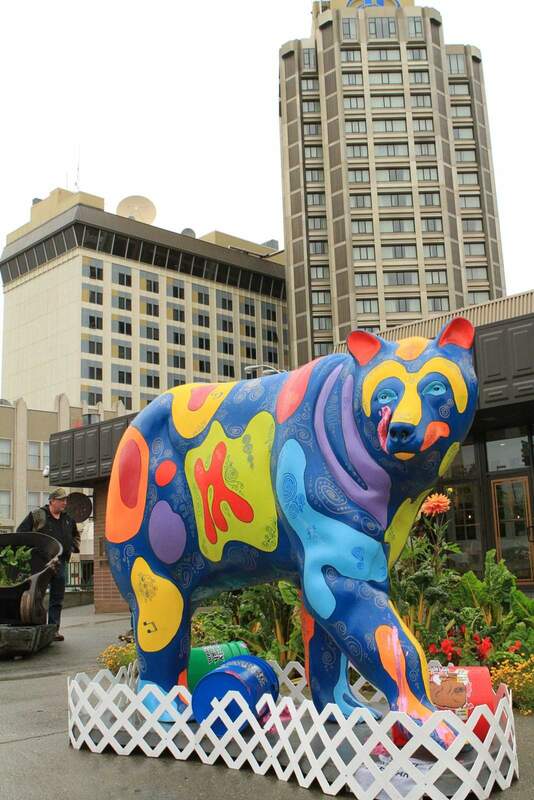 The statues were installed to increase awareness of grizzly and black bears that live within the city and to highlight an international bear conference hosted by the city. 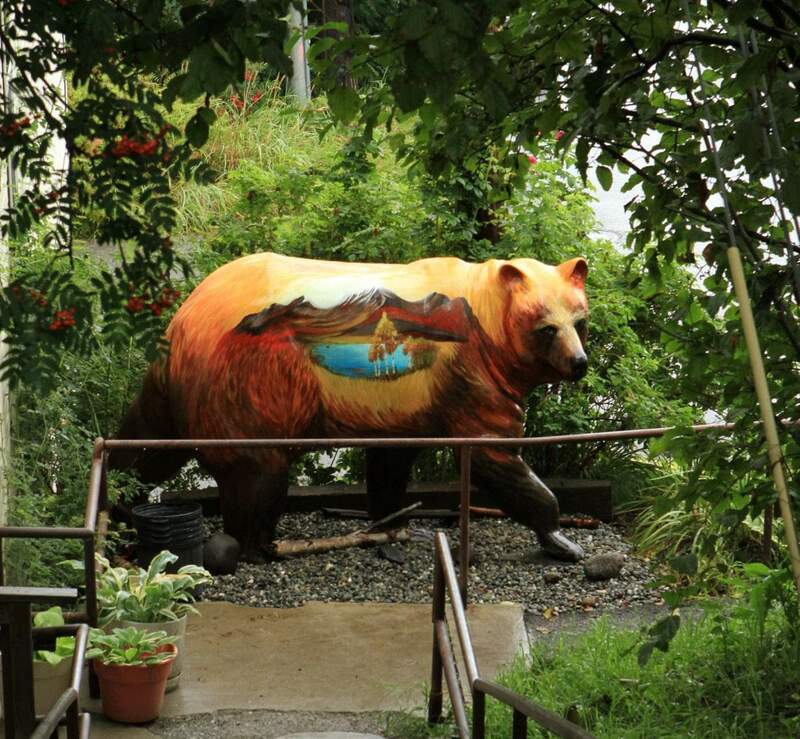 A life-size, fiberglass bear statue painted with a mountain scene stands at the bottom of stairs off a downtown street in Anchorage, Alaska. A life-size, painted fiberglass bear statue, part of a “Parade of Bears” display, stands in front of a an ice cream shop in Anchorage, Alaska. ANCHORAGE, Alaska – Alaska’s largest city is home to more than 300 grizzly and black bears – and now more than a dozen multicolored ones. 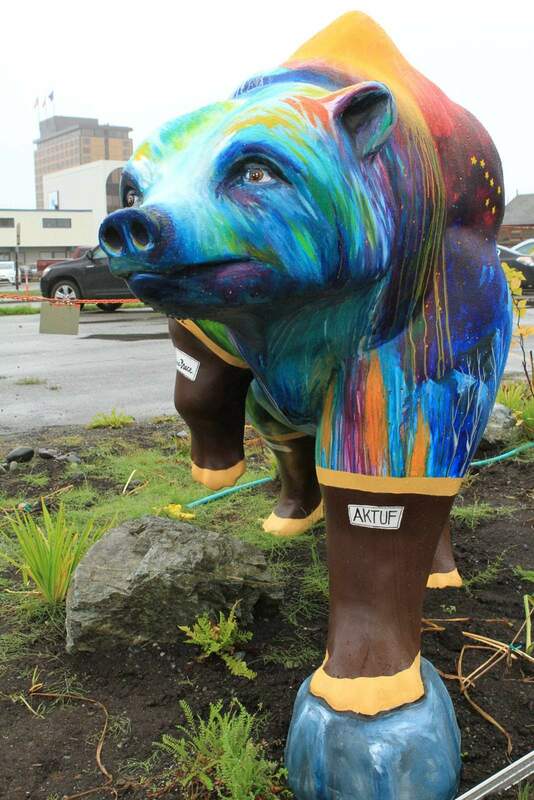 Life-size statues painted by city artists for a public art installation called “Bears on Parade” are popping up as part of an effort to raise awareness that if you live in Anchorage, you live near bears. “The whole point of this was to engage in conversation about bears and their habitat – the food that they eat, where they live,” said Brenda Carlson, a tourism official who helped organize the program. Bears can be deadly if they are surprised. To minimize maulings, the department’s Anchorage Bear Committee, which is dedicated to local bear conservation, tries to educate people about how to live alongside the animals. Fifteen bears arrived by flatbed truck looking like polar bears – completely white. Sponsors paid either $1,750 or $3,000 for bears. So far, 13 have been painted, sealed and erected. “I love that tongue,” Carlson said, and it could fit into the theme of what a bear should not eat – human food. The statues arrived too late for the early summer bear conference, but some scientists will benefit. The committee is donating nearly $8,000 from statue sponsorships to the next conference to cover scientists’ expenses.